Bonds fabric instantly. Care & repair. Korbond Instant Repair Tape is a perfect temporary fix for hemming. The double sided bonding tape instantly adheres to most fabrics, easily hemming trousers, skirts, dresses and more. No sewing or ironing required instant repair tape is also useful for many craft projects and applications. Instructions: Turn garment inside out and choose the width of new hem. Cut Instant Repair Tape to required length. Place the adhesive side of the Instant Repair Tape onto fabric inside hem and firmly press the tape into place. Peel the backing paper from the tape and carefully fold the fabric back over the tape until hem is bonded. 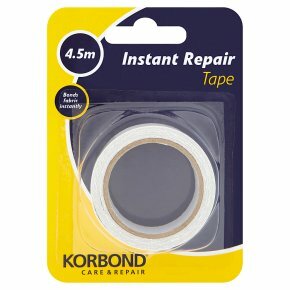 Care Instructions: Korbond Instant Repair Tape is designed to be a temporary fix for emergency hemming. Please ensure the tape is removed from garments before washing or ironing. This product is not intended to be a lasting solution. Please use Korbond Hemming Web or Korbond Hemming Tape for permanent hemming.